Our aim at B for Bag is to make choosing luggage easy. There are number of ways how we work towards our goal. Firstly by providing you with plenty of luggage buying advice, i.e. what you should have in mind when buying new piece of luggage. 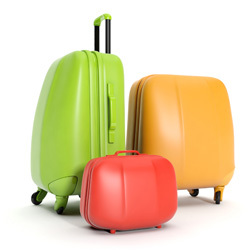 We offer advice on luggage material, weight, size, wheels, zippers, handles, etc. Or on everything you need to know to get the best quality luggage for your money. We explore what types of bags are most suitable for the different types of travelers, i.e. families, business travelers, backpackers, children, etc. Most travelers however fall into more than one group of travelers. For example, businessperson is likely to go on family vacations as well. He or she might also enjoy spending their vacations hiking with their backpack. Most travelers therefore own more than one piece bag and use them on different occasions. In this section, we look at the most popular luggage types within each group and help you to compare luggage, i.e. the different types, brands and luggage pieces. There are so many different types of luggage available. There are suitcases, spinners, roller cases, garment bags, totes, duffel bags, mobile offices, etc. We look at the pros and cons of each luggage type and explore which type of travelers / trips they are most suitable for. Finally, we offer ample general luggage tips and advice, i.e. from how to read luggage reviews to how best to pack your bag for airport security. This is how B for Bag guides you towards choosing the right bag for you and your travel needs. Of course, not everything will be relevant to you. You should find it easy to navigate our website but you can also use the search button at the top to search for any particular subject. You could assume choosing luggage should be easy. After all, there are so many bags available. Too many choices can however be confusing so B for Bag helps you to sort out right candidates for you and your trip.